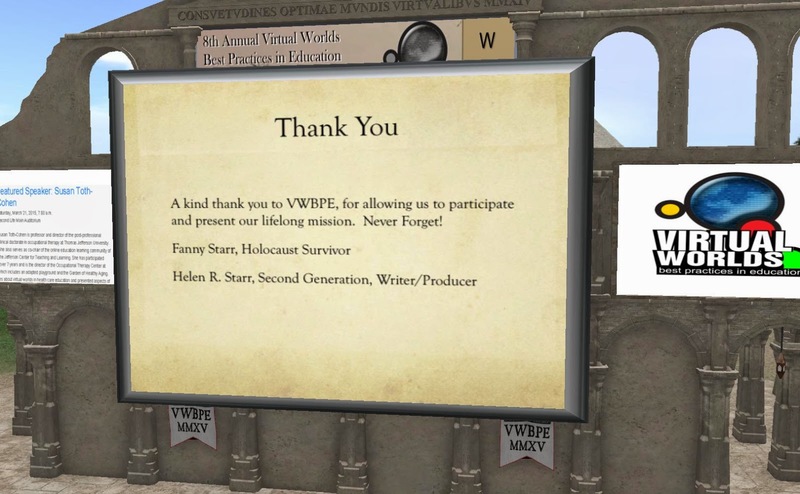 On March 21, The Virtual Worlds Best Practices in Education Conference had an unusual guest speaker: FannyStarr Hilltop. 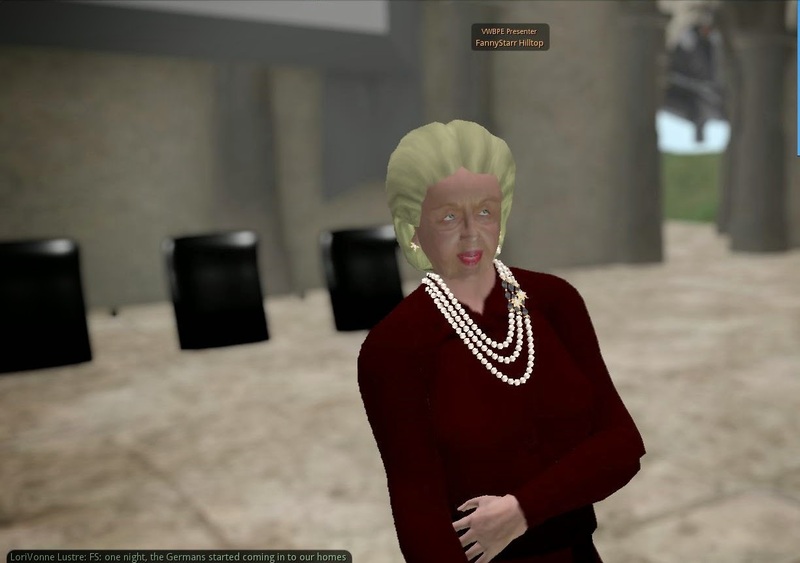 In real life Fanny Starr is a survivor of the Nazi Holocaust of WW2, in which they murdered a total of eleven million civillians, the majority in concentration camps. Explorer Dastardly, FannyStarr's real life daughter (Helen Starr), was there with her near the podium as she spoke. LoriVonne Lustre typed what she spoke via voice and posted it through announcement chat. Under the Nazi regieme, about 20,000 concentration camps, ghettos, and similar locations were set up, used for various purposes from slave labor, temporary way stations for transit, and extermination camps built for mass murder. The places FannyStar had been stationed at were the Lodz Ghetto, where people faced starvation and disease, Auschwitz where those imprisoned faced the gas chamber and crematorium, Mauthausen which killed by working people to death, Ravensbruck, which had women only, which provided slave labor for Siemens Electric Co., and Bergen Belsen which also killed through diseases and starvation. FannyStarr described her experiences to the audience. She had been born in the city of Lodz Poland, home to Europe's largest Jewish community, and lived an ordinary life until September 1939, when Hitler ordered German forces to invade the country, which was overrun in less than a month, "In 1939, The Nazi’s came and took control of the Jewish population, 230,000 Jews, and established, the Litzmannstadt (Litzman’s City) or the Lodz Ghetto and locked-up all the Jews. I was made to work in a tailor shop, making uniforms. I did not know how to sew. We did not know, we were youngsters." Life in the ghetto was brutal as the Nazis crowded large numbers of people in tiny sections of town, with the threat of death if they tried to leave. For food and medicine, they had to rely on smuggling and what were essentially starvation rations provided by the Germans. These combined with the breakdown of sanitation led to thousands dying from starvation and disease. Explorer Dastardly spoke, "There was no food or a place to grow food. People started to die and the bodies started to pile up." FannyStar added, "We did not have a hearse or a way to being bodies to the cemetery." There were also acts of unbelievable cruelty, "In The Lodz Ghetto, my mom got sick with pneumonia, and we took her to the hospital. The Nazis did not have complete control of the hospital. We heard the Nazis where going to the hospital, and I ran with my sister to the hospital to get our mother. We heard loud noises in the corridors; the Nazis were shouting, 'get out,' and they took all the patients out of the hospital. The Nazis took the mothers who just gave birth to newborns and shot them dead. The Nazis went to the nursery, and took the babies. The Nazis laughed as they smashed the babies smashed into the walls. They took the legs of the babies, and tore them into two pieces. We rescued our Mom, somehow." She paused, "This is so hard to talk about, even after 70 years. Why did this happen?" Eventually, the Nazis made the decision to deport the Ghetto's Jews, Explorer saying, "When the ghetto was closed, everyone was sent to concetration camps." FannyStar spoke, "We did not know why we were being sent to one direction or the other. We were marched to a big hall and stripped, our heads were shaved. I was with my younger sister, we could not recognize each other. We were marched again, and sat there for 3 days, naked. When we got off the train, my Mom and my brother were thrown on a truck, sent straight to the gas chambers. That was the last time I saw them. My father was sent to Dachau. My sister died in Teblinka." Explorer pointed to a certain image on the screen, "In this image you see the SS symbol, Irma Gresse." FannyStar commented through voice the symbol still made her shiver with fear after all those years, "Irma Gresse would go around and hurt people for no reason. My sister and I were picked to go to Ravensbruck. There was no food or water. People died. I was lucky. I cut myself and was told that I had a disease, so I had to go to the gas chamber. My sister came with me and she talked them into saving me. She is my lucky charm." FannyStarr was asked, "What would you tell people who are Holocaust deniers?" She described once overhearing a priest saying that it was a good thing that the Holocaust had taken place, "Hitler did a good job." She was taken aback, especially since that it was someone from the clergy saying that, "I stood up and said 'you should be shamed,' and I walked away." 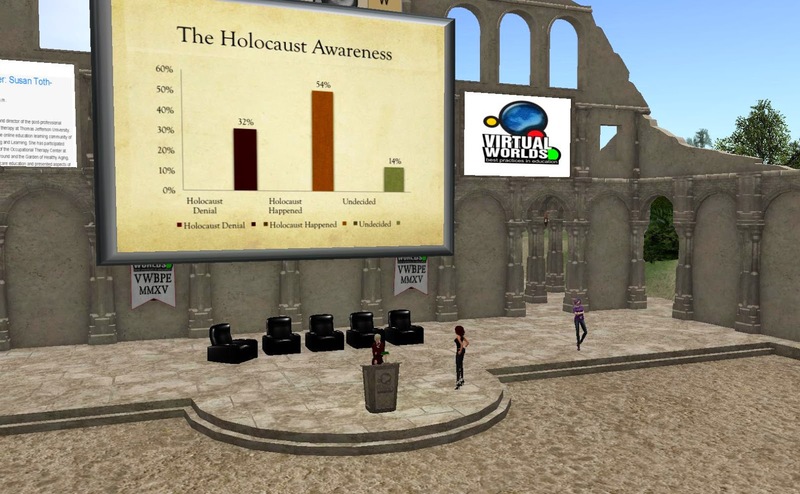 A chart placed on the display screen showed a survey (taken by ADL Global 100) in which about a third of those surveyed think either the numbers of civilians murdered in the Holocaust was either greatly exaggerated, or never even happened. In the United States, it is the Klu Klux Klan and other extremist groups with anti-Jewish attitudes that are responsible for the holocaust denial movement. Around the world, over a billion harbor anti-Semitic attitudes. Why the resurgence of anti-semitism and Holocaust deniers? Explorer Dastardly felt, "The Internet has brought out the deniers and empowered anti-semitic movements through radical extremism. Web 2.0 empowers bullying and hatred by encouraging sometimes anonymous acts of violence to promote their beliefs. In Italy last year, there was a group of neo-nazis who published all the personal information about Jews in Italy." But technology could also help stop the anti-semites, "but also, the Internet and this technology allows us to speak and educate as well. People need to know and the more they will prevent such things happening again." 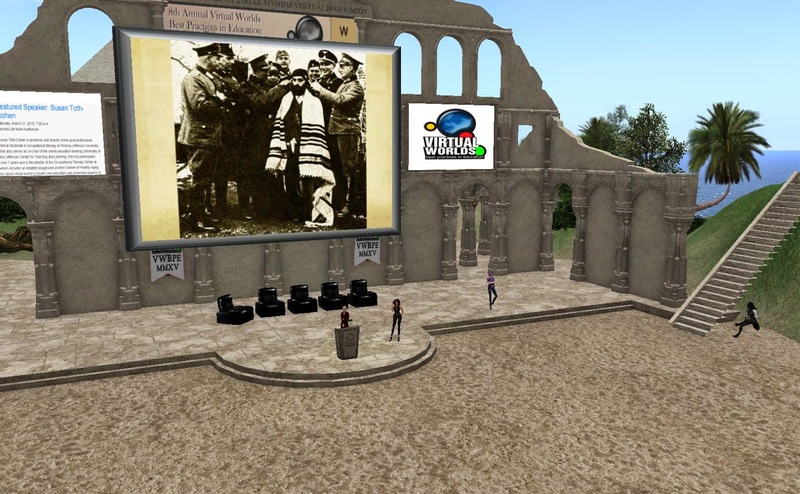 Explorer then spoke, "What we can learn from Holocaust education? Holocaust education engages the mind to think about: Discrimination, Genocide, Hate, Racisms, Religious Oppressions, Survival. To preserve the truths we must listen the last speaking survivors. Once the survivors are gone the Holocaust becomes a myth, and people will ask, Did the Holocaust ever happen? What about education the whole world? Are we doing a good job in letting people know that they can survive?" FannyStarr commented, "We were all tortured and murdered without mercy. We fought for thousands of years to have our country. Thank God we got our country back. Halleuah we got our country back! I do not know WHY? Why were we cursed? AFter the war I became an atheist, asking God why I lived to see what was done. I would like to know if any one in the audience has answer?" The answer was moments of silence, followed by someone saying, "There IS such a thing as evil, and it hates the people that bear the name of G_d." FannyStarr spoke, "When we started going to the schools, we were often asked why don't you change your denomination? No I said, I was born a Jew and I will die a Jew." Someone asked why she was an atheist for a time. She answered, "Because initially I could not cope. We were the chosen people. ... When I had children, we decided we needed to show them what it is to be a Jew. It is important to go on with your lives and tell the stories so others know." Someone asked how they felt about the Germans today. FannyStarr answered, "The chancellor made them provide the information in schools." Explorer added, "In Europe it is mandatory to teach about the Holocaust. In the US we try to teach it, and ask that this become mandatory. It is taught in a limited way in some schools / states." There were questions about Nazis who fled to Argentina, and the current government in Greece bringing up German actions in the country during World War 2. Could Genocide happen again? FannyStar thought it was possible, "Yes. Why can it happen? People are being praised for attacking Jews." Explorer told the crowd, "If you can't teach in one way, you can teach in other ways. Think about how we are using this platform to talk to Fanny, the survivors." When asked about if they came across any non-Jewish survivors the of Holocaust, Explorer answered, "Many do not want to talk. They are shamed. They are still in shock because the could not stop what happened to them. One of my mothers friends was orphaned, and she felt shamed." FannyStarr mentioned, "One thing my husband and I felt was important. As we knew what hunger was, we feed homeless people. We deliver food the homeless and the mentally ill, sandwiches and water that we distribute downtown." Someone asked how she felt about laws in some states making feeding the homeless illegal. She answered, "I feel good when I can feed a homeless person. The government is against it. A policeman told me it was against the law. I told him, I am a holocaust survivor. He left me alone." Someone asked "Why didn't everyone run?" FannyStarr answered, "Why? How could you? we were too scared." Someone asked if they had any hint as to what was about to happen. FannyStar answered, "No, we had no idea. In the ghetto, we were told by Romkowski that we were going to a paradise. It was bitter herbs, not paradise. I still remember when the Nazis took my father and interrogated him. He was beaten so badly and thrown on our steps. Mom tried to bandage his poor head. There are so many stories about the brutality of the Nazis. They were despicable. When there was the trial, they all denied. How could they kill young people like my brother.... he was a beautiful singer. He could have had a wonderful career." Someone was asked how they felt about the issue of an independent Palestinian state. FannyStar answered, "If this will bring peace, I am not against it. But people need to work together to have this." Explorer remarked, "we want a state but Hamas has to go. We all saw what Bibi said about not supporting the Palestinian state. however, he has backtracked. He acknowledges that there must be peace with all Israel's neighbours. We all agree that Hamas has to go. They have ties to ISIS." Someone asked, "My family were Polish Jews, and no one spoke about it. We must have had family members who died. How do we find their stories?" 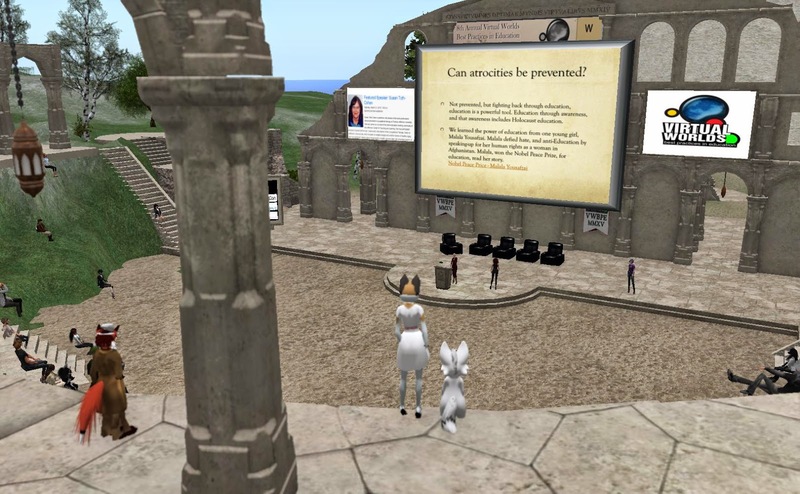 Explorer answered, "I would recommend going to the list of sources on the slides I shared. There is a lineage site, genealogist and family historians. Yad Vashem - http://www.yadvashem.org Write to them and give them all the information that you can, and they will help you." Someone asked if they came across non-Jewish in the camps. FannyStarr answered, "No, were were restricted." Explorer explained, "Jews were separated. The way that the Nazis treated the Jews was like they were a disease, like the plague." Another asked, "How did the Nazis keep the ghettos and the Holocaust a secret? I would notice if my Jewish neighbour disappeared." Explorer answered, "The towns were asked, did you not notice the smell from the concentration camps? They did not have an answer." Another asked, "The movie 'Schindler's List' was horrific. Was it understated?" FannyStarr answered, "It is understated. It does not even begin to show the horror we experienced. I met Mr. Spielberg. Perhaps it was because we were ahead of him in telling these stories." Explorer commented, "My movie that I recommend is 'The Odessa File.' "
Another asked, "Auschwitz is recently being restored. There is a proposal to make this space a home for indigents, rather than preserving it as is for future generations." FannyStarr hadn't heard about it. Explorer thought, "This should be brought up to the Jewish community." Someone asked, "What would people be willing to do to make peace with Palestine?" FannyStarr answered, "I don't know. It is up to the people." Explorer added, "I think it would take recognition of Israel as a Jewish state, that the Jews are a people. If we can get past that, we can have peace." Explorer spoke, "We can never forget that the Holocaust happened. Stop blaming the Jews. Wat is funny about burning a person alive? Nothing. Keep sharing, and thank you." FannyStarr concluded, "It is a different perspective when you see the faces in the screen than in person. Believe that such a thing happened. History repeats. We must stop it." The crowd reacted positively to FannyStarr and Explorer, "I want to apologize personally to this lady, I am sorry, I didn't realize you went through so much." "You and my mother lived so that you can tell your stories." "You sound like a great lady, and a wonderful lady to talk to." "We Love Mommy Fanny." "She stepped into her past for 1 and 1/2 hours - impressive. She needs to know how brave and courageous she is." "FannyStarr I want to tell you that you are great person and I am really sorry for what you experienced in your life. It's really sad." "Thank you Fanny for your words, it means a LOT to ME." "Remember all the victims of genocide and pray for peace." "We love you Fanny." "Thank you for sharing your experience." Explorer Dastardly is in a number of art groups, plus a Volunteer for the Relay for Life. Fanny Starr has been speaking about the Holocaust for 30 years. *Addition* Later on Explorer had a video of the event uploaded. Genocide Survivor Fanny Starr Speaks March, 2015 from Petlove on Vimeo.